Nina Pekermann from Israel is at 2:22 through 2.4 kilometers. Two laps during the swim. 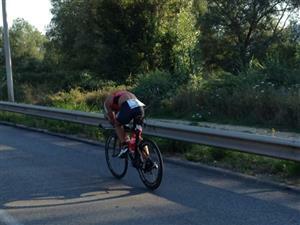 It's getting harder on the final meters - Panier and Jurkiewicz try to set off a bit. 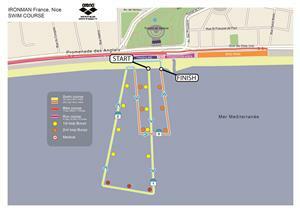 Just to mention: Jan Sibbersen (GER) set the best ever swim here in Nice back in 2007 - unbelievable 44:44 minutes. Frederik van Lierde (BEL) had a sensational swim here on his way to the victory in 2012 - in 47:22 minutes. Anthony Pannier had the same time in this race. Here they are - back in Nice and ready to rock T1. Sylvain Sudrie is the first man out of the water in 50:36. Romain Guillaume won IRONMAN Lanzarote in 2014 thanks to a perfect bike split - he is first man on the bike today in 53:07. Cait Snow is out the water in 57:43. 7 seconds - that's the gap between women's first and second place. Jeanne Collonge is on the hunt. Last year''s runner-up Victor del Corral is out the water in 58:11. He is 7:35 behind. Joerie Vansteelant (BEL) and Mike Schifferle (SUI) get out the water next to each other - about 10 minutes behind the lead = strong bikers are on the way now. Jeanne Collonge is in the lead - she had a great transition. Nina Pekermann is third out of the water - 2:51 behind. Super fast swim for age group athlete Maurice Mülder from Germany - 52:37 minutes. He is in 7th place overall after the swim. On the women's side, age group athlete Sonia Piron (FRA) is in 3rd place overall in 58:10. Olympic time trial silver medalist Emma Pooley had an okay, but not a great swim being 8:57 behind in the water. It's a bit comparable to Swiss uber biker Karin Thuerig - she always made it on the bike. Through 11 kilometers of the bike Romain Guillaume is in the lead, 24 seconds behind we have a group of five. Sylvain Sudrie, Drew Scott, Anthony Pannier, Bertrand Bilard and Jeremy Jurkiewicz. Let's talk about a great swim this morning, the 50:39 minute swim of Drew Scott. The 24-year old is in his rookie IRONMAN pro race here in Nice today. He has been participating at the IRONMAN world championship in 2011 as an age group athlete in the category 18-24. He was USA Triathlon Amateur athlete of the year in 2012 and turned pro in 2013. He had a great race in May taking third place at IRONMAN 70.3 St. Croix. Drew's family has some Nice memories: His father Dave Scott was runner-up at the Triathlon International de Nice in 1983 and 1984. Update women's race, kilometer 11: Jeanne Collonge opened up a gap of 40 seconds on Cait Snow. In third we have Nina Pekermann at 5:35. 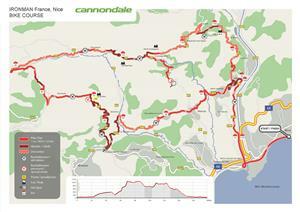 The men start into the first climbs after 20 kilometers. Romain Guillaume is 33 seconds ahead of the group of five now. Hammering: Romain Guillaume on the first kilometers of the bike course. The first men have reached the first timing point on the course at Km 27.9: Romain Guillaume is 29 seconds ahead of Drew Scott. Behind these two we have a gap of about a minute. Km 20, update women: Cait Snow is in the lead - 37 seconds ahead of Jeanne Collonge, Lisa Roberts is in third at 6 minutes, Pekermann in fourth at 6:30. Boris Stein is on a solo ride to make up ground - he is in 8th place now through 28 kilometers. The gap is 7:37 due to a fast pace at the front. Caitlin Snow attacked as soon as she touched the first uphill section. She looks great. 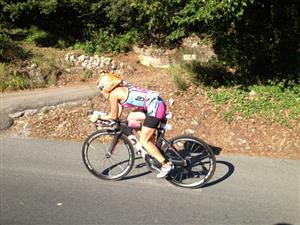 Women, Km 27.9: Jeanne Collonge has downsized the gap. She is a strong climber and directly behind Cait Snow now. The pass has been made - Jeanne Collonge is in the lead. 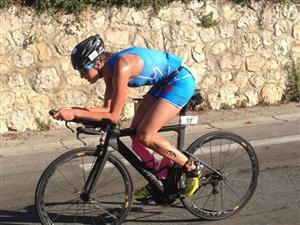 What a nice story: Jeanne Collonge and Romain Guillaume lead the race, they both live in Nice - and they are a couple. Lisa Roberts is 5:43 behind in third place at Km 27.9. Jeanne Collonge is leading the race - her bike set-up looks like she is ready for a day including a lot of climbs. 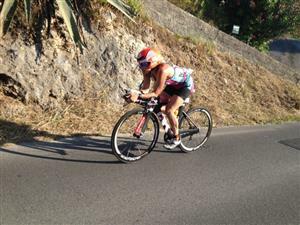 Emma Pooley will pass Nina Pekermann in the next moments for fourth place.